Heralded by trend forecasters as the colour of the year, rose gold accessories are becoming the must have for on-trend accommodation providers. Originally called Russian gold, the colour was hatched with Faberge’s famous egg creations and came to prominence with Cartier’s infamous, intertwined wedding rings and jewellery. 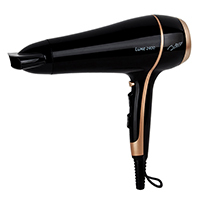 The Nero Luxe hairdryer by Weatherdon reflects the providence of luxury in many ways. A high gloss finish and warm sophisticated glow is an unexpected head turner in the midst of mundane metallics. Where once the only options were black and white, rose gold will surprise and delight guests and add a distinctive tone to the bathroom. Weatherdon’s team of gun-designers has made some fashion forward decisions, opting for black and rose gold Off/On heat control buttons, avoiding the traditional red-for-heat and blue-for-cool shot. The slighty longer cord of two metres, just that little bit extra to eliminate tedious times or contortion tricks to reach the power point. Rose gold is sprinkled across every fashion and style chart and now accommodation providers can step up and generate a modern romantic hue to the guest experience.